Looking for a refreshing beverage? 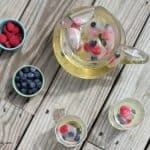 This Summer Sangria is the perfect option with crisp, refreshing flavors and pretty seasonal ice cubes that take it up a notch. Last week I promised I would share my Summer Sangria that I made over Memorial Day Weekend when I made my Strawberry Pink Velvet Gooey Bars. It was the perfect refreshing beverage that was just a bit sweet and not a ton of alcohol that only one glass would suffice. It is a perfect beverage for 4th of July because of it’s patriotic colors and shapes, but it would really work any time during the Summer. The key to this Summer Sangria is the preparation. 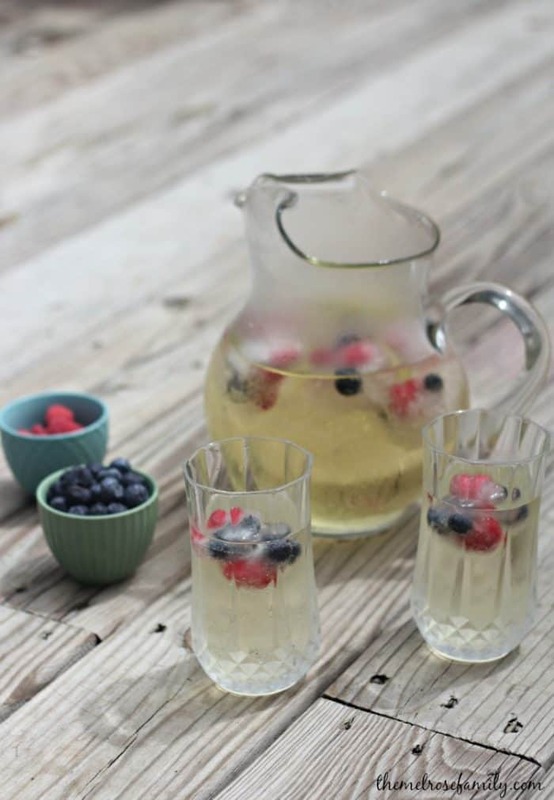 If you want to knock this Summer Sangria out of the park, the night before you plan on serving it you’ll want to make the Moscato berry ice cubes. I used two different shapes for my ice cube trays. I used my star shaped ice cube tray for the Moscato berry ice cubes that went into the pitcher of sangria and my daisy shaped tray in each glass for serving. I dropped in blueberries and raspberries, but you could do any type of fruit that fit into your ice cube shapes. Patriotic Soda Bottles and other stars and stripes decor up for Memorial Day, which is why I went with the stars in the pitcher of sangria. It’s not necessary to do this though. You could just toss in raspberries and blueberries, but my guests loved the added touch. 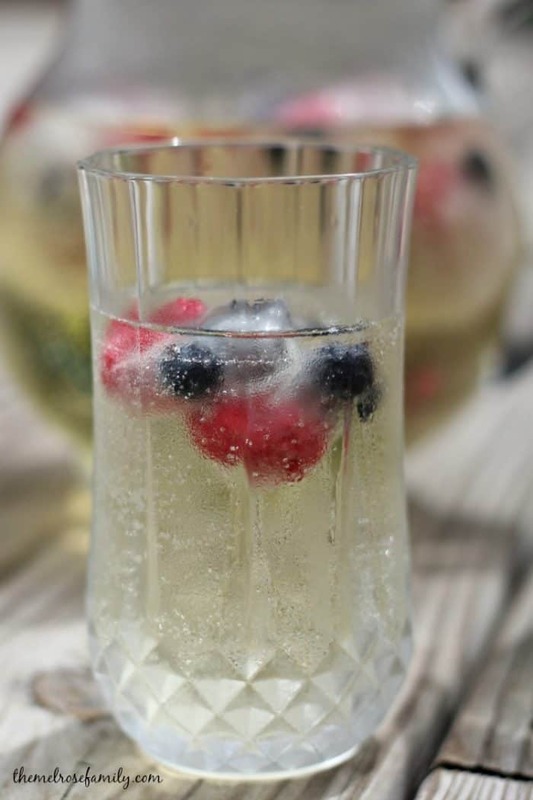 Looking for a refreshing beverage to serve at your next get together? This Summer Sangria is the perfect option with crisp, refreshing flavors. Place 3 blueberries & 3 raspberries in each star shaped ice cube mold and pour moscato over the top. Freeze for at least six hours. 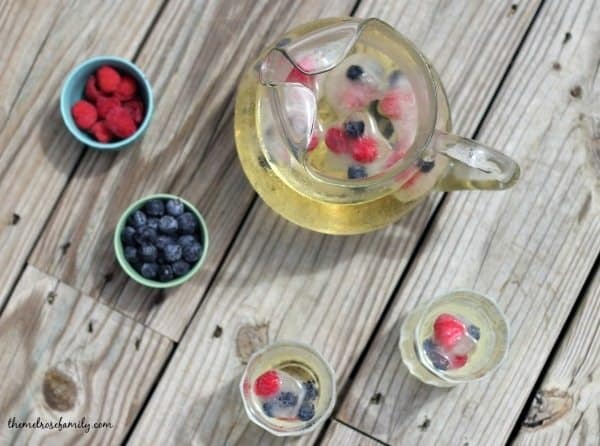 Place the berry ice cubes in a large pitcher and pour in the rest of the moscato and the second bottle. Add in the white grape juice and orange seltzer and stir. Refrigerate. 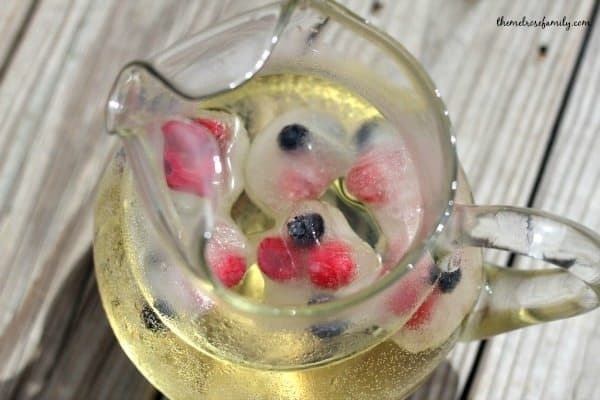 Serve over moscato berry ice cubes.